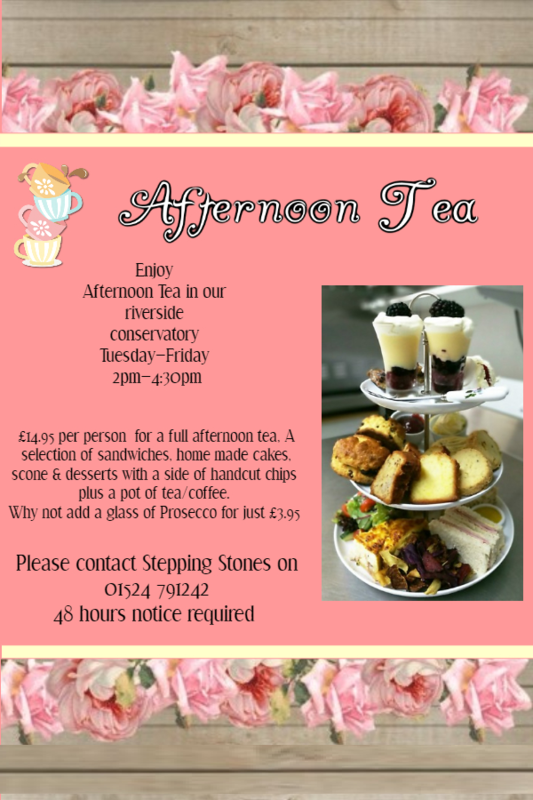 Stepping Stones would love to welcome you for a cup of tea and a slice of our homemade cakes or a bespoke Afternoon Tea or even a delicious home-cooked meal made using the finest local produce. We are a friendly bunch and strive to provide the same warm welcome to every one of our guests. We are happy to cater for a variety of dietary requirements, we just ask for 48 hours’ notice. Please call us to discuss your requirements. Our Afternoon Tea is available Tuesday to Friday 2pm – 5pm. We are a small team and all of our cakes and savouries are made to order so please do give us a full 48 hours’ notice for us to work our magic. Please note that we do not serve Afternoon Tea on a Bank Holiday weekend including the Monday and Tuesday following the Bank Holiday weekend. Our conservatory can seat up to 64 people and offers stunning riverside views of The Wyre across to Nicky Nook and the Trough of Bowland. The conservatory is available for private hire for a la carte meals or buffets, we can also organise the decorations and entertainment for an extra charge. We offer an affordable lunch menu starting at £9.95 Tuesday – Friday and we can offer smaller plates for smaller appetites. Our main menu ranges from light bites to a full a la carte menu and our specials board changes depending on the seasonal produce available. We use local suppliers including Honeywells meats, Bradshaws veggies and Dewlays cheese… not forgetting Wallings ice cream and local milk. Bookings are welcome and definitely advised on a weekend or Bank Holiday or if your party has 10 or more people. Call us on 01524 791 242 and we can discuss your requirements to ensure that your visit is an enjoyable one. Parking: Large car park available on site with accessible spaces.